Tuesday December 3rd 1901 I was busy about the work all forenoon. Will and I went to town in the afternoon. He brought the cattle down this morning and sold three to Mr Elliott. he gave me $40.00 of the money and I paid the paper bill at Stillnells. I took Fannies butter but did not see any of the girls. Wednesday December 4th 1901 I was busy all forenoon getting up a nice dinner as I expected the Price family. They did not come. Mary Woolf spent the afternoon here. Will brought a fine red cow from Mr. Elliott in the morning. Thursday December 5th 1901 It was an ugly day with snow flying. I did churning and got the dinner. I put in the afternoon varnishing pictures and blacked the stairs with some stuff I bought of an agent that was horrid. 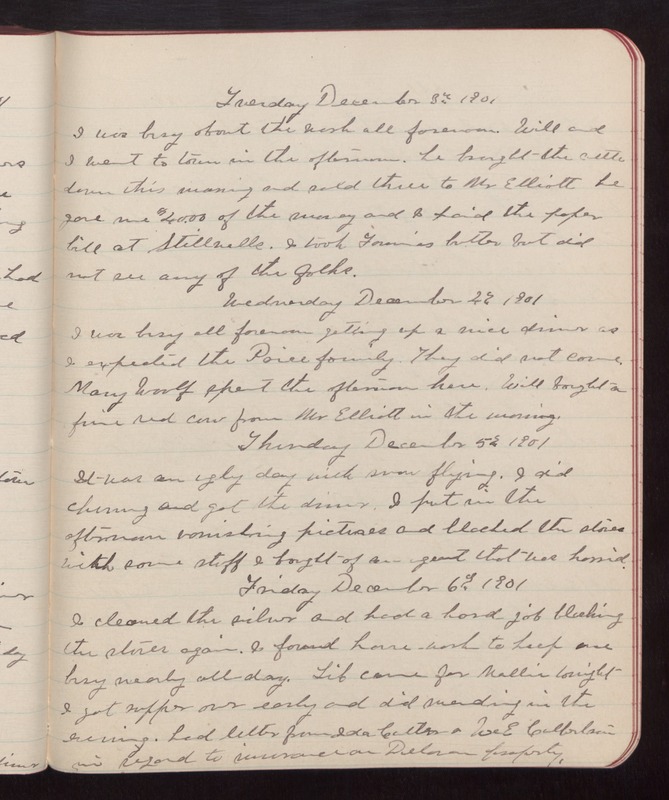 Friday December 6th 1901 I cleaned the silver and had a hard job blacking the stairs again. I found house work to keep one busy nearly all day. Lib came for Mollie tonight. I got supper over early and did mending in the evening. had letter from Ida Cutter & [illeg] E Culbertson in regard to insurance on Delevan property.